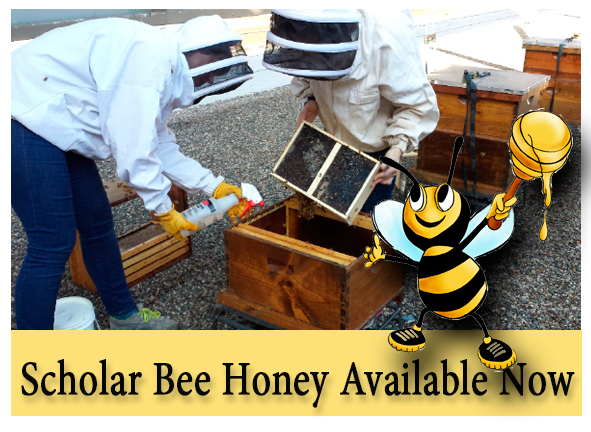 In 2014, the St. Paul Public Housing Agency (PHA) joined the league of urban beekeepers to support initiatives to increase the bee population and sustain native biodiversity. The PHA collaborates with Mademoiselle Miel, local entrepreneur, who oversees beehives at various St. Paul and Minneapolis municipalities and commercial agencies. The beehives are housed on the rooftop of the PHA’s Central Administrative Office located in the. Andrew Boss Building; 555 N. Wabasha Street. Your support benefits the local community and especially PH residents and Section 8 participants! Contributions will aid in funding the PHA’s George and Nancy Latimer Public Housing Resident Scholarship Program. The scholarships assist public housing residents and Section 8 participants with funds to pay for post-secondary education. Since 1996, PHA has awarded 130 scholarships totaling $108,500. We thank you for your support of this initiative! Thank you to our partner, MADEMOISELLE MIEL!